my_xml is a very simple and easy to use XML parser for Python. I quickly tested it with GeeXLab and it works fine. nodes-lists, or leaf nodes. Access to the nodes by using attributes. This module is good only for simple XML! No name-spaces, CDATA and other fancy features are supported. I tested my_xml with Python 2.6.6. The output of this script is displayed on the screenshot above. Hi. 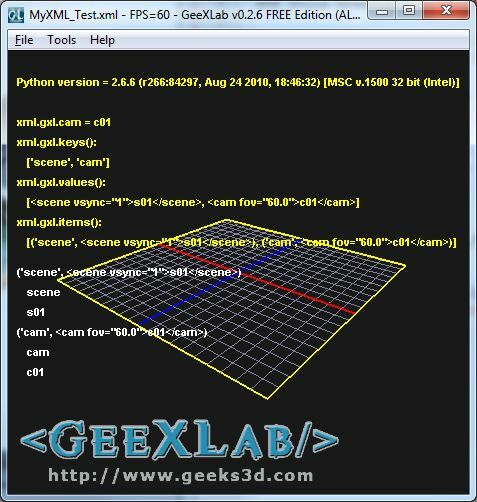 Do you plan to extend support of Python by GeeXLab to version 3.1? I didn’t look at it yet, but if the Python 3.x C API is similar to Python 2.x API, I can add it in one of the next versions. Python 3.2 support added in the next GeeXLab 0.2.7!